Firefighter/Paramedic Wayne Oliveira, Fairhaven Fire Department Public Information Officer and Education Coordinator, demonstrates how using water on a grease/gasoline fire can make the fire get bigger instead of putting it out, at the Fairhaven Fire Department Open House held during National Fire Safety Week, on Sunday, 10/7/18. Photo by Beth David. 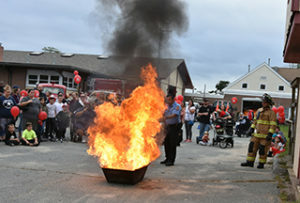 The Fairhaven Fire Department elicited many an ooh and aah at its annual open house and fire safety demonstration on Sunday, 10/7/18 at the Fairhaven Fire Department Head­quarters. Free activities included a bounce house, pizza, punch, popcorn, fire hose, “Jaws of Life” demonstra­tion, and, of course, fire. Sparky the Fire Dog was on hand, and children also received free fire hats and other small goodies. This year, the Fairhaven Harbor­master had a table with information on water safety, and free labels for kayaks. And the Board of Health had a game with prizes for kids (of all ages) to teach the proper way to recycle using the curbside service. Children could also climb around fire trucks, tour the station, and ask questions of real fire fighters. 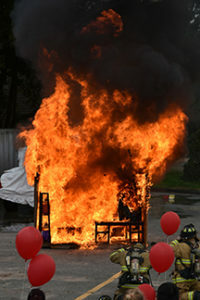 A safety house was filled with smoke to show children how to get out of a building quickly. 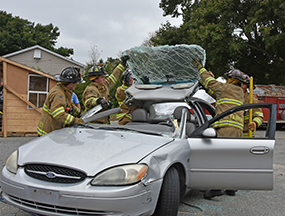 Fairhaven Firefighters peel back the roof of a car to demonstrate the so-called “Jaws of Life” hydraulic tool designed to take apart vehicles to get people out who are trapped after an accident at the Fairhaven Fire Department Open House held during National Fire Safety Week, on Sunday, 10/7/18. Photo by Beth David. Firefighter/Paramedic Wayne Oliveira, FFD Public Information Officer and Education Coordinator, took the crowd step by step as firefighters took apart a Ford Taurus with the so-called “Jaws of Life,” an hydraulic tool used to break apart vehicles. The big draw, though, as always, was the fire demonstrations. Mr. Oliveira explained the fire triangle: Heat, oxygen, fuel. A fire needs all three to burn. So a fire can be extinguished by smothering it (taking away the oxygen), cooling it off with water, or taking away its fuel source (or letting it burn out). But water is not always the answer. Mr. Oliveira demonstrated how using the wrong fire extinguisher can actually make a fire bigger. Using a water-based extinguisher on an oil or grease fire, which would most likely be a kitchen fire, will make it roar up and spread quicker. Some extinguishers use powder, some use foam, and some use water, he explained. 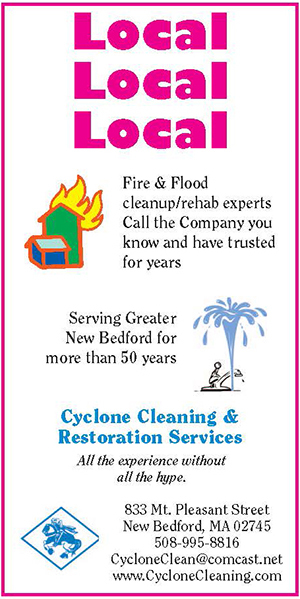 And it is important to have the right one handy, and to know how to use it before an emergency arises. He explained how the hose should be pointed at the base of the flames, not the middle or the top. Firefighter/Paramedic Wayne Oliveira, Fairhaven Fire Department Public Information Officer and Education Coordinator, shows Holly Shurtleff the proper way to use a fire extinguisher at the annual Fire Department Open House in Fairhaven on Sunday, 10/7/18. Photo by Beth David. Holly Shurtleff answered the call for a volunteer and tried her hand at using the fire extinguisher, at the urging of her son, she said. The department also burned a small building in the parking lot to demonstrate how quickly a fire can spread and how firefighters respond. Firefighter Nick Gautreau geared up, including his breathing mask, to show children what a firefighter would look like crawling through the smoke to save them if they ever got trapped in their homes in a fire. Mr. Oliveira said they can look pretty scary if children do not know what they look like. He told the crowd that they only have about 30 seconds to a minute to get out of the house if there is a fire. He said they should not collect belongings, but should quickly alert other family members to get out. 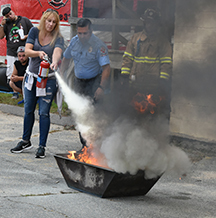 A small building is fully engulfed in flames to demonstrate how quickly fire spreads and how firefighters respond to a fire at the Fairhaven Fire Department Open House held during National Fire Safety Week, on Sunday, 10/7/18. Photo by Beth David. He also told the crowd that smoke can make people disoriented, not just because they cannot see, but also because inhaling it can diminish their ability to think clearly. He said smoke from house fires now are more toxic than many years ago because we use more plastics and synthetic materials. And, indeed, when the building burned, the old TV blew up, making a huge noise and causing some loud gasps. After the fire started, the smoke detector went off, but then stopped when the fire reached it, reinforcing the notion that there is not a lot of time to get out. Alex, 9, said it was his first time at the event.